XENIA — Community members and Greene County leaders will light a candle and pause for peace at the annual candlelight vigil 6 p.m. Monday, Oct. 1 at The Greene Town Square, located in the center of The Greene Town Center. 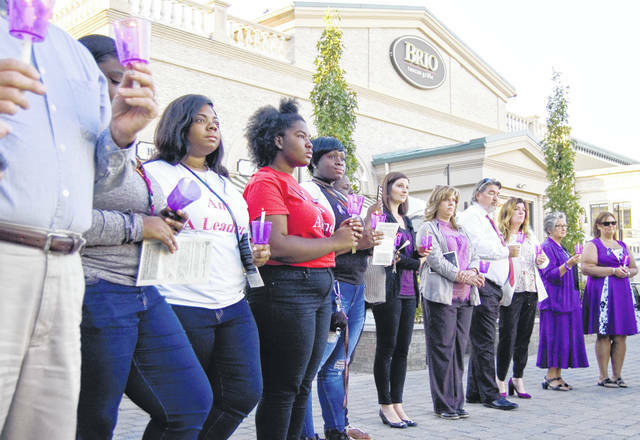 The vigil, hosted by the Family Violence Prevention Center of Greene County (FVPC), will help raise awareness of domestic violence in Greene County as part of National Domestic Violence Awareness Month. The entire community is invited to attend. This is the second year for this central location for the vigil. The program includes special music and the “Clothesline Project,” a display of story-telling T-shirts created by service recipients of the center. Additionally, a survivor of family violence may share his/her personal story of how violence in the home strongly impacted his/her entire life. For more information about this event, call FVPC at 937-376-8526 or 937-426-6535. Interested persons can also visit the Ohio Domestic Violence Network’s website at www.odvn.org for a list of events taking place throughout Ohio in recognition of National Domestic Violence Awareness Month. If you are a victim of domestic violence or know someone that is, contact your local police department, or FVPC. Do not close your eyes to the violence. If you believe that the abuse will stop without help, you are wrong. Statistics show that over time the abuse gets worse and more frequent.